I took a bike ride after reading the WordPress photo challenge for this week, I was armed with my camera and an eye for color. Vivid subjects for photographing presented themselves at every turn of my wheels and handlebars. 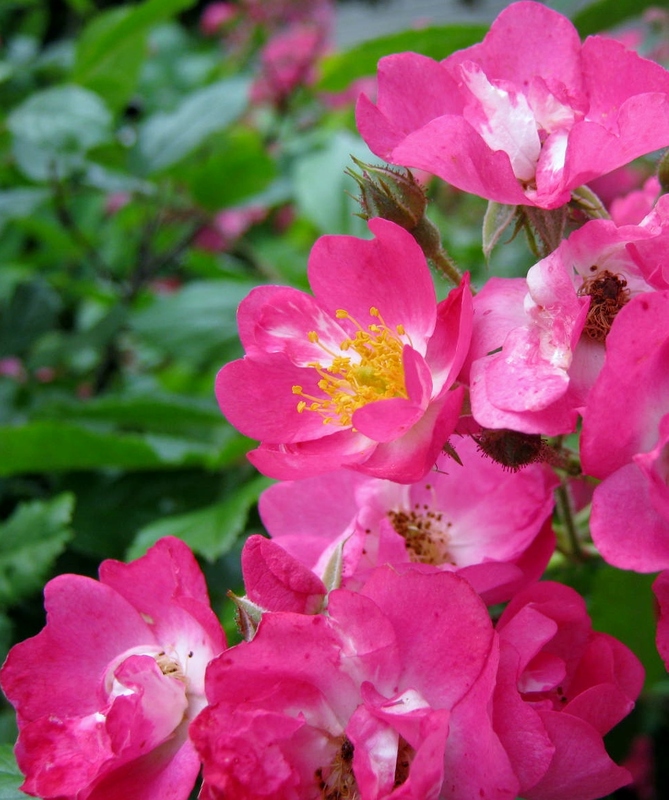 When I came upon this beautiful rose bush, ablaze with color, I knew I need not pedal any further. Cascades of pink with yellow centers glowed vividly under the early afternoon sky. On closer inspection, I heard, then saw, dozens of honeybees clustered on the pollen laden centers. 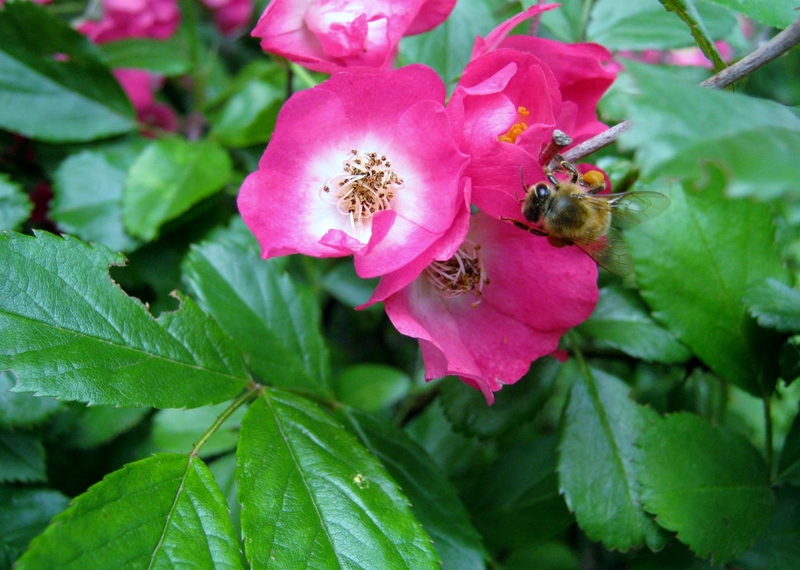 The rose bush was abuzz with their gathering. I love honeybees, my grandfather had hives, and now my sister is a beekeeper. 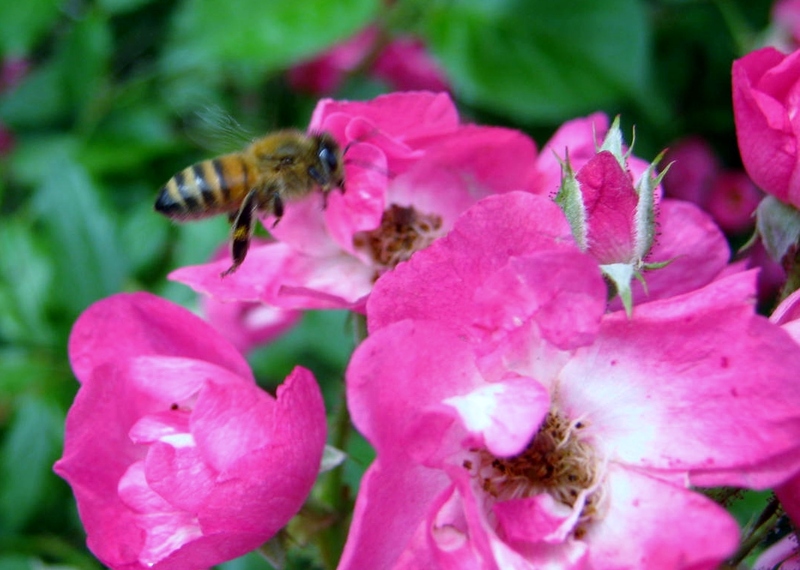 The bees, enraptured with the bounty of pollen, were quite the willing subjects for my photographs. I wonder if they might be from my sister’s hives. 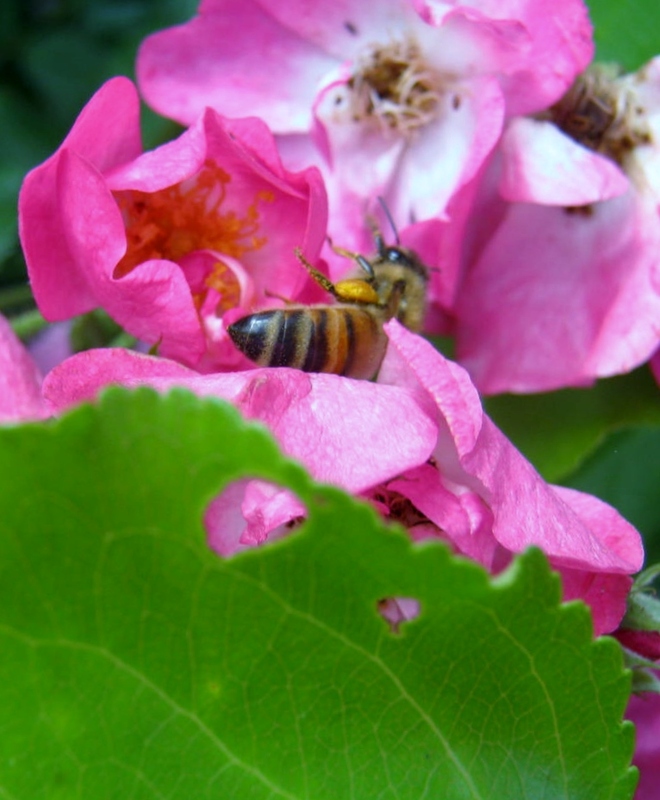 Honeybees can gather honey up to six miles from their hives, but usually stay within a two mile radius of their home. I enjoy the WordPress Photo Challenges. 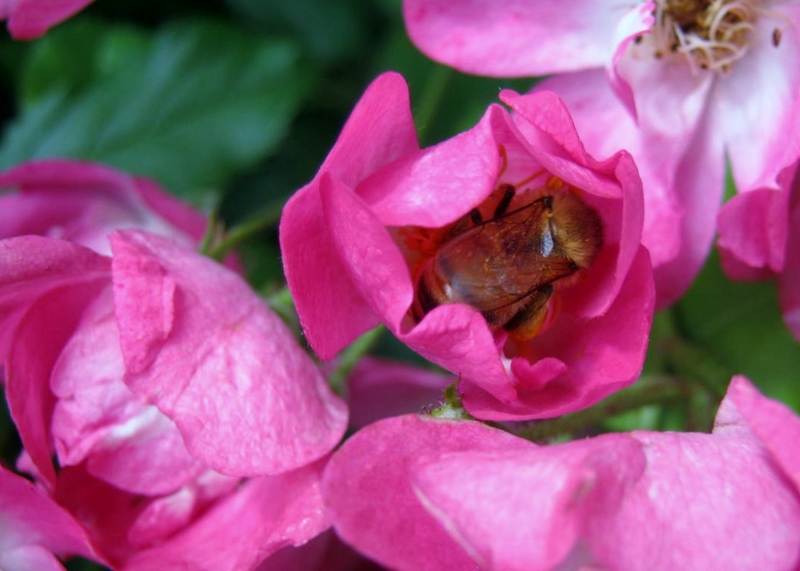 If I had not ventured out with my camera, I wouldn’t have experienced those fifteen carefree minutes standing beside a rose bush ablaze in petals of pink and abuzz with gathering bees. I like the one with the bee inside. You can see how clear the wings are. Nice pictures. Do you get fresh honey ? Yes, and the honey is lovely. It is has a terrific taste. Which is the best honey to taste ? Sometimes I see acacia honey, forest honey and so many other types of honey in the shops here- which would taste best ? Hi Susie, I can never really taste the difference unless the honey is a very dark variety and then they have a robust flavor. Everything else tastes pretty much the same to me…like honey, and always delicious! Same here, Kathy. May you have a blessed Sunday. God bless you too Susie! Have a happy day today! Were you able to go to worship ? Thank you for your kind wishes – they make me so happy each Sunday when I get them ? Hi Susie, It is still very early here. I am going to a very meaningful service in a few hours. My uncle, has been a pastor for over 40 years, he is retiring this Sunday. It will be his last sermon as a fulltime pastor, although I am sure he will fill in for other ministers when they are on vacation. I will see a lot of my family and friends who I have not seen for many years. It will be a happy day, and yes, a day of worship. Have a blessed day dear friend.